Small fabric squares and a great imagination. Great project for beginners. 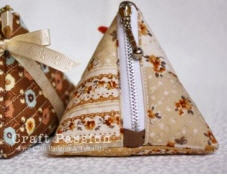 A very cute tutorial on how to make tiny triangle coin purses. This is a very well written tutorial with clear instructions and great pictures. Wouldn’t these make great gifts? I can’t wait to make some! It doesn’t have to be grand, it just has to be great. See more pillows. I like their thinking. Still not enough lace. Waking up here would be okay. A nice use of linens and pillows. It sings comfort. A little lace on the window would be nice. How many of you set the table for everyday meals? 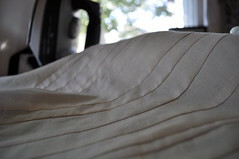 How many of you have linens that only see the light of day during the holidays or special occasions? In this fast paced society we live in now, wouldn’t it be nice to slow it down for a little family time? I love this idea and thought I would pass it along. When I was cleaning out my linen closet a couple months ago, I came across a forgotten stack of bandanas. I had forgotten I even had them, it was so long since they had been used. I formerly had taken them to Pioneer Village Living History Museum, just north of Phoenix, for use as costumes by the boys in my school class, when we were on that field trip. (But it’s been five years since that district banned field trips for financial reasons!) So, being in a “piecing” frame of mind, I had the idea of sewing them together to make a tablecloth long enough to cover one of those 8 foot city park picnic tables. Luckily, I had 18 bandanas, so I . . .